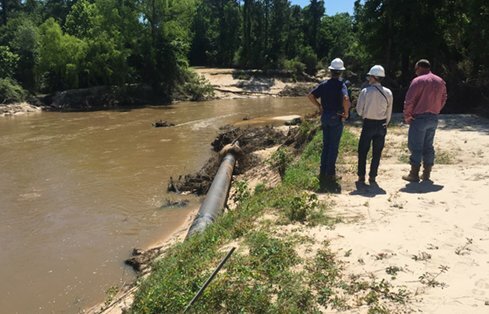 Heavy rain and flooding eroded the bank of Spring Creek and exposed the 24-inch natural gas pipeline. GeoEngineers was contracted to design the HDD profile for a replacement segment of pipeline. Once exposed along the bank, the pipeline became vulnerable to wear and tear from the water and floating debris. 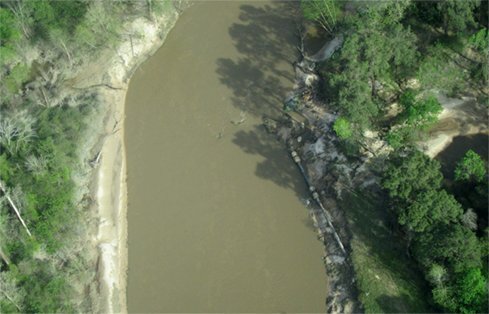 An aerial view of Spring Creek, showing the exposed pipeline along the right bank. GeoEngineers provided on-site construction support and consultation, including daily site reporting and contractor work plan evaluation. Comprehensive “turnkey” geotechnical and environmental services for an HDD pipeline replacement. 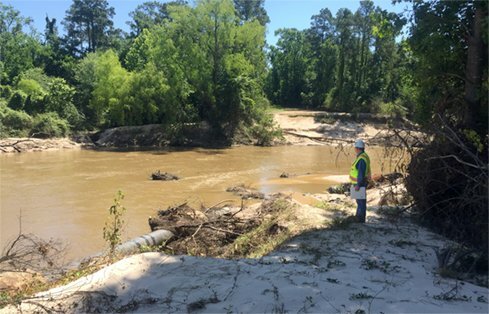 In 2016, Trunkline Gas Company (TGS) became concerned about the condition of a 24-inch natural gas pipeline running through Spring, Texas. The original pipeline crossed beneath the town’s namesake, Spring Creek, but heavy rains, flooding and debris torrents scouring the creek bed had eroded the banks so much that the buried pipeline became exposed. 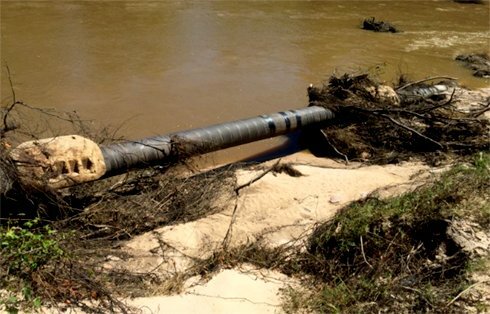 To fix this issue, TGS decided to replace the segment of pipeline with a new crossing below the active erosion zone. TGS hired GeoEngineers to design the horizontal directional drill (HDD) profile for the approximately 1,700-foot-long crossing, perform geotechnical exploration and laboratory testing, site survey and make construction recommendations. Because of GeoEngineers’ range of service offerings Spring Creek was essentially a “turnkey” project for TGS—GeoEngineers oversaw nearly all aspects of the project from start to finish. Early on it became clear that the project would require a significant amount of environmental permitting to stay in compliance with local, state and federal regulations. Instead of bringing on a second consultant to handle permitting efforts, TGS saved time, money, and effort by keeping the work with GeoEngineers. Our experienced environmental professionals worked closely with the geotechnical engineers, avoiding costly back-and-forth over design and permitting details, and keeping the project moving forward. The project site straddled the boundary between Harris and Montgomery Counties, which meant balancing very different permitting requirements from each. Harris County is home to Houston and has a long list of strict environmental regulations that had to be satisfied. Along with these regulatory standards the team had to overcome practical engineering limitations, property boundaries requiring multiple permits and additional design and permitting stipulations from the county’s drainage district. Together, these challenges turned the pipeline alignment into a complex puzzle. Fortunately, Jackson Cooper and the GeoEngineers team were up to the task and designed an HDD alignment and profile that limited the project’s impact on the environment and adjacent rights-of-way while reducing the number of required permits. Geotechnical exploration, including visual site reconnaissance and two 80-foot-deep borings to assess subsurface conditions. Soil testing of samples in our fully accredited Baton Rouge lab. Served as the Project Team Manager and provided third-party on-site survey and mapping services during the HDD design, permitting and construction phases of the project. Complete HDD design in accordance with applicable pipeline design codes, including analysis of potential risk of hydraulic fracture, drilling fluid discharge and hole instabilities. On-site construction support and consultation, including daily site reporting and contractor work plan evaluation. Complete permitting services, from strategic recommendations to obtaining the permits. This included an environmental permitting literature review, coordination with local, state and federal agencies and working closely with the design team to maximize compliance with all applicable local, state and federal agencies. GeoEngineers gave TGS a “turnkey” experience, managing almost every aspect of the project. The segment of pipeline under Spring Creek was replaced. GeoEngineers’ multi-disciplined team quickly added in-house support for environmental permitting when needed—improving the quality and efficiency of the project without the need for an additional contractor. The contractor completed the trenchless HDD installation in accordance with applicable environmental regulations and now natural gas is flowing safely under Spring Creek.